Those who, like The Legal Genealogist, have ancestors from what are called the state land states know the pain of trying to identify a land parcel that is described as beginning at an oak, running to a maple, thence to a rock in the stream and so forth. Because it is just so easy to take that description and go directly to that parcel of land. Or as close to it as 21st century backroads can take you, at least. It was a cash sale — so there aren’t a lot of the kinds of documents you can get with a homestead. No proof of settlement, no affidavits, nothing like that. Just a patent and a receipt for paying for the land. And, thrown in for good measure, the easiest way in the world to get to his land, in person, now that I’m doing a road trip in Mississippi. The federal Bureau of Land Management has a website for General Land Office Records where you can search by an ancestor’s name for Federal land conveyance records in the Public Land States — patents, survey plats and more showing the transfer of the land from federal ownership to individual ownership. If you navigate to the General Land Office Records, and click on the link for Land Patents, or navigate directly to the Land Patents search page, you can enter the information you have available and search across many records. In my case, I was looking for land in a particular location. So in the location fields, I chose Mississippi and then Winston County. And I was also looking for a particular ancestor’s land, so I entered his surname — Gentry — in the Names box. I could have included more information — the land description, for example — since I already had that, but the great joy of the website is that you don’t need a whole lot of information to do a thorough search. 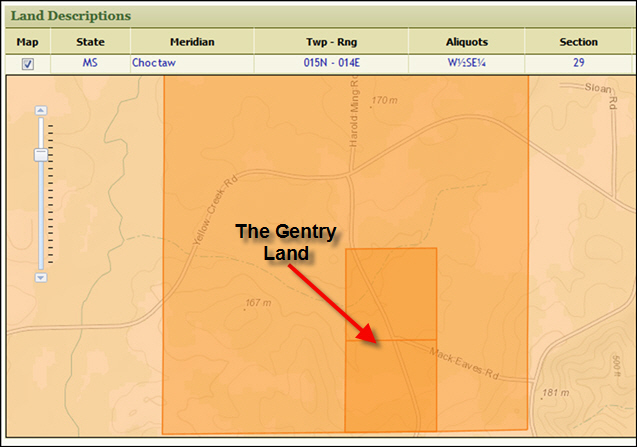 In my example, there’s only one Gentry land patent in Winston County, for my third great grandfather Elijah Gentry, and clicking on that link took me to the patent details page. And that’s where you’ll find the extra little goodie section that I used yesterday. Scroll down to the bottom. You’ll see a section entitled Land Descriptions, with a map of the United States. There’s an unchecked box under the word Map in the left hand column. Go ahead and check that box. The map zooms in to Winston County, Mississippi, and overlaid on that is the exact area of Section 29 that was patented to Elijah Gentry. You can easily see that it’s east of Louisville, the county seat of Winston County and north of Mississippi Highway 14. On the left hand side of the map is a zoom bar where you can zoom the map in or out even more than it is now. Go ahead and start zooming in — keeping in mind that you may need to drag the map area itself to keep the Gentry land visible. With just two more clicks of the zoom bar, you can begin to see local roads, and not just the state highway. 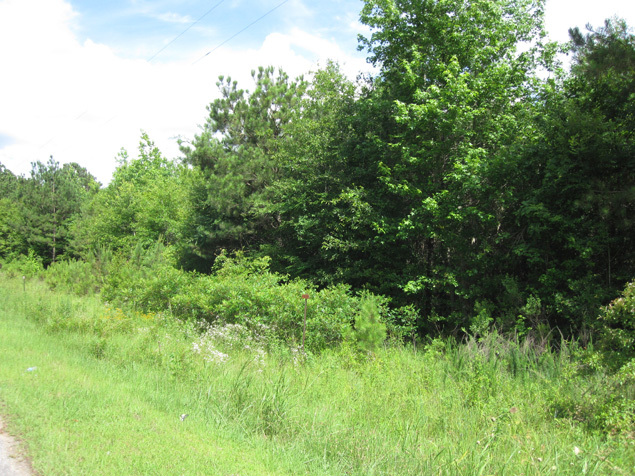 You can see that the land is along Harold Ming Road, between Highway 14 and Yellow Creek Road. 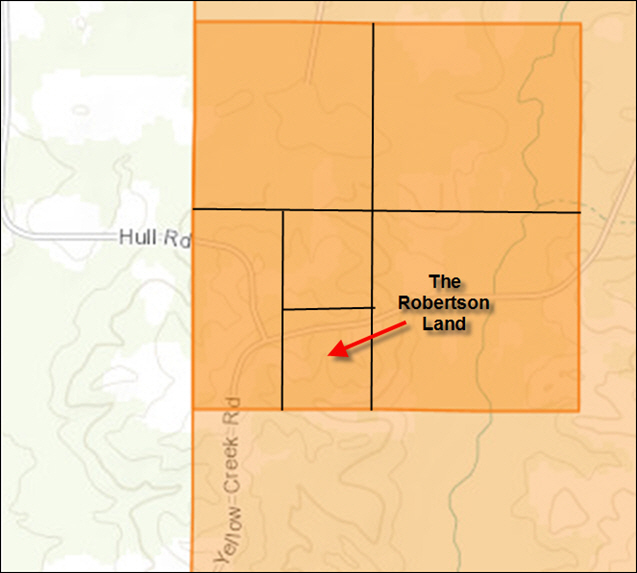 With two more clicks of the zoom bar, you can see exactly where the Gentry land is today: just south of Yellow Creek Road, with the center of the tract right where Mack Eaves Road cuts east towards Obie Smith Road. In other words… exact driving directions. Where I stood, yesterday afternoon, soaking up the feeling of standing where my ancestors did, on land that they owned, more than 170 years ago. Thank you so much, Judy, for posting all of this! 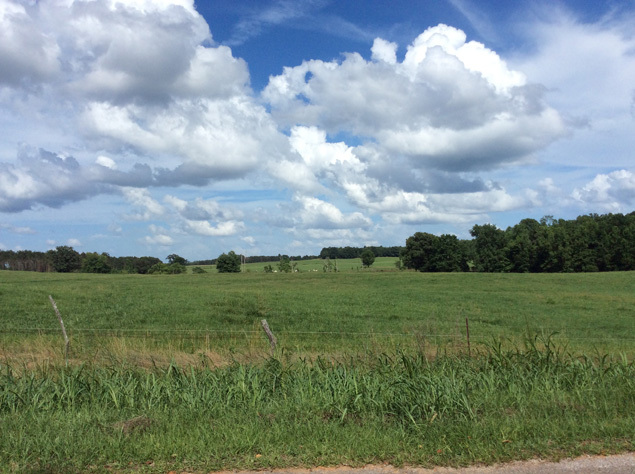 It brings tears to my eyes, I suppose partly because it’s so exciting to see pictures of the land where ancestors lived so long ago and partly because I look at them knowing that I will probably never make it to Mississippi to see it in person and to walk it in my own shoes. So thank you again, dear cousin, for sharing. I am so happy for you, Judy! We all know how wonderful it feels to stand on the land or in a house where an ancestor once stood. After researching a family for a long time, they become alive to us, and being where they once were is such a thrill. I agree that this would be quite a thrill! 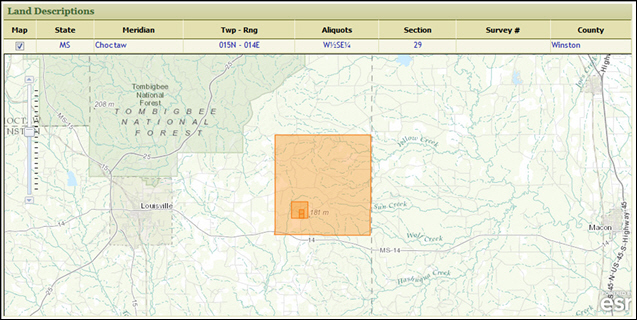 Unfortunately, only one of my family appears to have obtained land from the US and it is now deep in the heart of a national forest with no easy access. Pfft! Really cool feature! I wish google maps had a street view for my ancestor’s land. Lots of trees, so I guess to rural for them to go there. Thank you Judy! 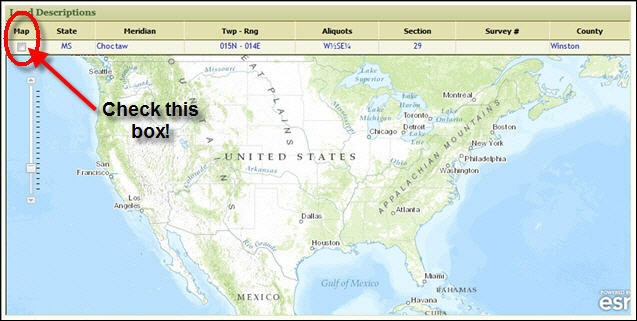 Another great tool for our Genealogical Toolbox. You are the bestest gencousin ever! If folks want tools to work with they can go back through your blogs and find some good stuff to work with. Oh, my. Something on my to-do list after I get more specifics about where some of my folks are. But since you gave such clear instructions (and some delightful results), I decided to give it a shot and try to locate some of my aunt-in-laws people, who I knew had land grants. Found those with ease, much to my delight. That was cool, so I just kept going. Some of my family have unusual first names and known locations so that helped. But by proximity I also found where my great uncles raised sheep in Idaha, a surprise to me. I found a load of stuff, some for sures, some probables, a few maybe’s. Best of all, I found a land record that completely debunked a claim I’ve seen made for my third great-grandfather who supposedly served in a particular regiment in the war of 1812. I was pretty sure he couldn’t have, and now I’ve found the proof. Ha. But it is also four hours later. How do these things happen? Once again, a great big Thank You, Judy. I found my 3rd great grandfather’s land and then went on to read about his regiment in the War of 1812. You Are The Best!! Welcome to Mississippi and Winston County! I’ve never lived in Winston County, but I have to commune periodically with my ancestors in the Plattsburg Cemetery in SW Winston County. Thank you for reminding us of the BLM website. Oh, my! I’ve used BLM to get the certificates of the five contiguous homesteads where my grandparents, three of her siblings, and their widowed father homesteaded in SD in 1907. But I certainly never noticed that little check box! And I can’t go there myself to visit. Even if this method only works for one of the plots, I’ll have some idea of what the place looked like. I do know that my grandmother hated that soddie, and that the families only stayed three years. All but one of them lost the land in the Depression. But now I’m going to go see what it looks like now. And I’ve lots of other ancestors who didn’t homestead who I’ll try out this method on, to find out what their homes looked like too. Thank you, thank you! I have done the same thing! Found the land at BLM site, and then gone and looked at it, stood on it, soaked it in. Goosebumps! One of the homesteading requirements, here in southwestern Ontario, was improving the road allowances. Better travel conditions were certainly a beneficial to the settler as well as the county. Would your ancestors have built the roads that ran along or through their properties? Can the original earliest building sites be identified? It’s like what we feel when we stand on the land which our ultimate Jewish ancestor Abraham bought from Efron the Hittite in Hevron. Thanks for the easy to follow instructions on the BLM site! This would have been a lot easier than using the plat maps I used after IGHR last week to find my McCrary’s in Lawrence Co. AL. Loved your photos and felt your happiness through the page. There is nothing like seeing exactly where they lived, even if it is now grassy land or high rise. This is such a great post. I am fortunate to have been visiting an ancestral farm as far back as I can remember because it is still in the family after 150 years. Last fall I was able to get inside the local church for the first time and that was quite a feeling.